Tube Filling and Sealing Machine handles 100 tubes/minute. Designed for plastic and metal tubes, PF10 Tube FillingÂ and Sealing Machine features servo driven metering system and servo driven lift mechanism for vertical, air-free bottom up fill. 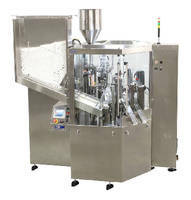 Automatic system can handle highly viscous products up to 3 million cps. Featuring 316L stainless steel unibody construction, machine is suited for cosmetics, pharmaceuticals, adhesives, sealants, and greases. Webb City, MO – ProSys Innovative Packaging, a global manufacturer of tube, cartridge, syringe and airless pump filling systems, will be presenting at Pack Expo Las Vegas 2015 Booth #C3809 their newly designed PF10 Tube Filling & Sealing machine with speeds to 100 tubes per minute. The automatic tube filling and closing system for plastic and metal tubes, features servo driven metering system and servo driven lift mechanism for a vertical, air-free bottom up fill. The PF10 Combo Plastic & Metal Tube Filling & Sealing Machine. Since 1985 ProSys has designed and manufactured manual, semiautomatic, and fully automated equipment for filling squeeze tubes, cartridges, syringes and rigid containers for the Cosmetic, Pharmaceutical, Chemical, Adhesive and Sealant Industries. We are a global supplier of filling systems with sales, manufacturing and customer service facilities located in the USA as well as International Sales and Service locations around the World.